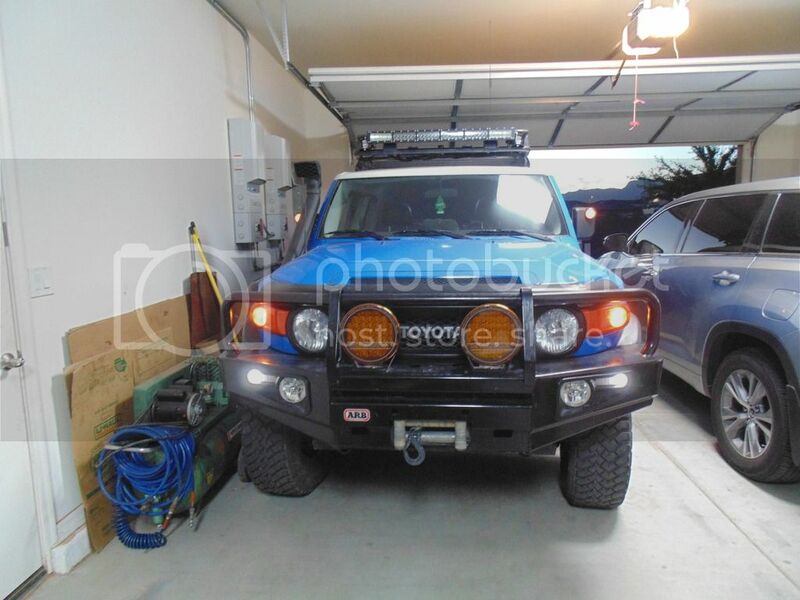 Toyota FJ Cruiser Forum > Toyota FJ Cruiser Discussion > Stereo / Electronics / Electrical > Lighting > Show us your lights!! Time to show off your stuff boys and girls! chriskrossapplesauce and FatJohnson like this. Re: Show us your lights!! So starting with the front, i have (2) 196W Chinese copy of the ARB Intensity with amber covers (the ARB covers fit perfectly as i assume they are the same lamps). In the ARB bumper I have IPF fogs with PIAA crystal ION 85W H3 bulbs (amber). 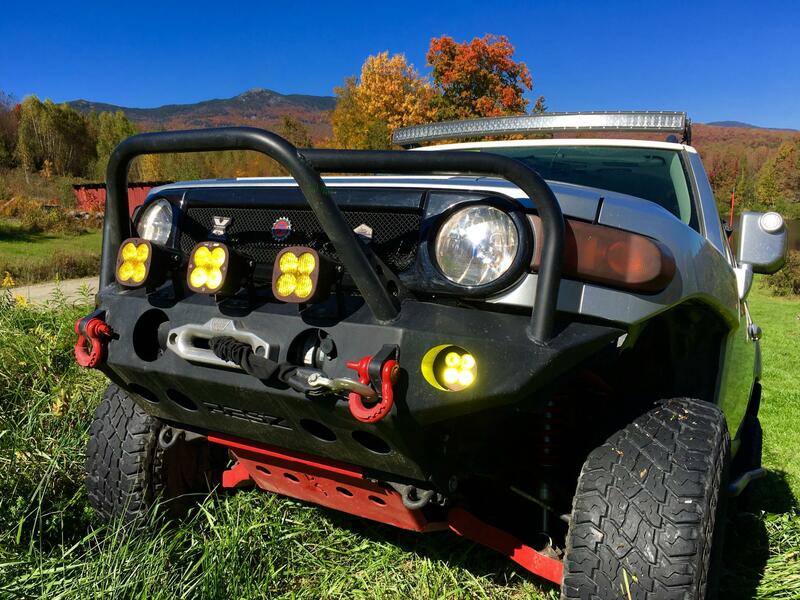 The park/turn signals in the bumper are also LED upgrades from ARB. In the mirror lights i have removed the diffusers and added amber bulbs. 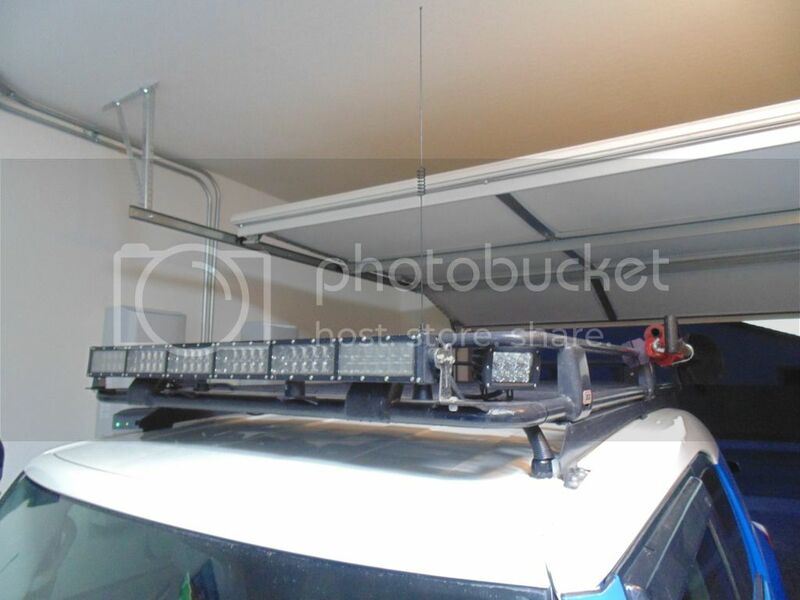 On the roof is a 580W 42" light bar featuring 7W Philip LEDs with 4D lenses. On the corners are 30W cubes which illuminate around corners nicely. In the rear on the roof rack are another set of 30W cube LEDs which are triggered off the reverse lights. On the Bandi mount is an 18W cube with amber cover for my rear fog/dust light. Baja'ing it on desert trails, this really helps the guy behind me. Unphazed1337, FatJohnson and A.O. like this. Very nice!! Obviously a guy that likes his truck, and uses his lights!! Unphazed1337, Red Crow and debFJVT like this. On bumper top I run a single Baha Designs XL80 "cannon", driving combo (9500 lumen) flanked by two XL Sport wide cornering (1800 lumen ea). 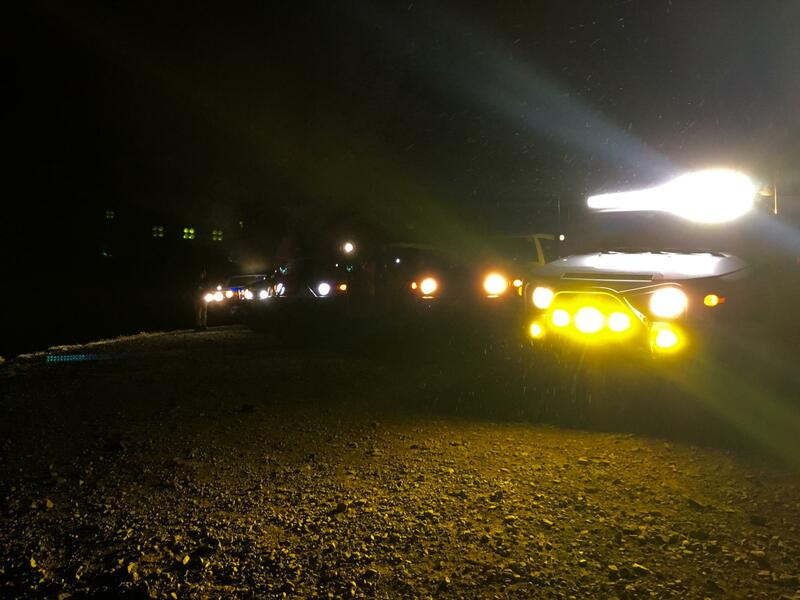 In-bumper fog lights are Squadron Sport wide cornering (1800 lumen). 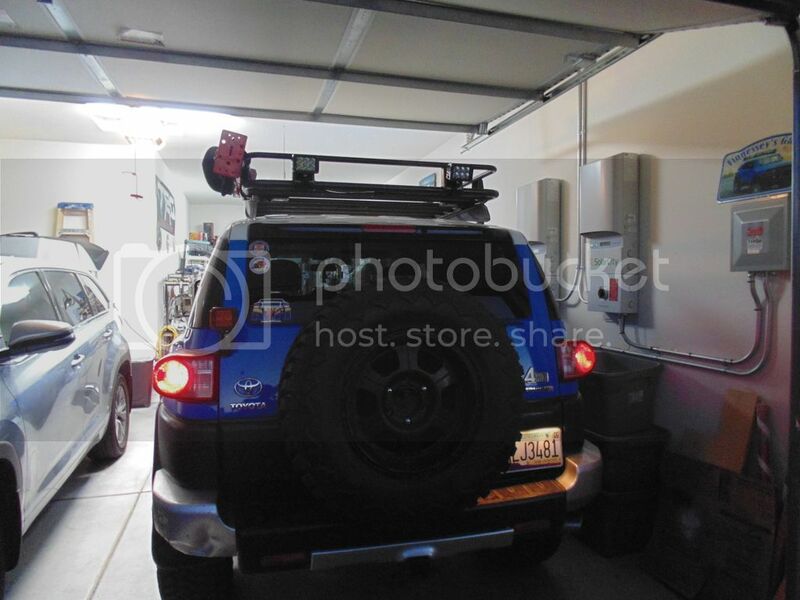 On the roof, Lifetime LED 50" curved lightbar, Baha Designs Squadron Sport wide cornering rear lights on the roofrack. Soon adding Baha Designs S2 wide cornering (2150 lumen ea) cowl mounted lights to fill in the dark zones to the side. This was near Engineer Pass at Summit in horrible weather...ran my rear lights to help light the trail for the rest of the group. Amber lenses not only helped cut through the fog/sleet but also made the light less blinding. Can't say enough good about Baha Designs, both their lights and awesome customer service!!! Unphazed1337, bazross, Iconic_ and 1 others like this. Tell me about your Lifetime LED 50" curved lightbar please.. 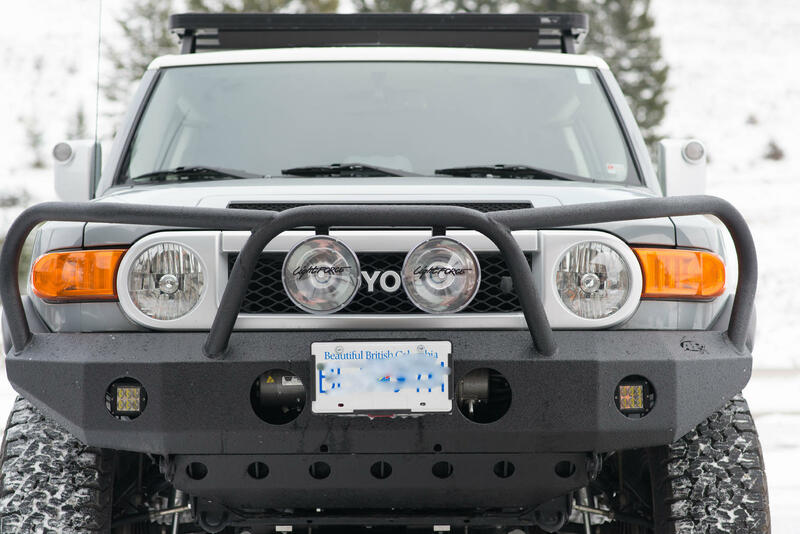 Lifetime is a midrange lightbar ($500 - $600) with an excellent warranty. My first one developed condensation - had a replacement at my door 3 days after I reported the problem. No issues with the new one. Very bright, combo pattern. Unphazed1337 and ZerosFJ like this. Unphazed1337, bazross, ZerosFJ and 3 others like this. So what mounts are you using? I run a set of Rigid D2's in the bumper cutouts and Lightforce 170 Strikers in the middle hoop. The combo works well for me out here. Not much light pollution in this area, so gets pretty dark at night on the secondary roads or through the National Parks. Lots of wildlife lurking around as well. Unphazed1337, DRTCRZR and Iconic_ like this. Last edited by RadiumFJ; 10-23-2016 at 04:13 PM.